What makes the Kids Active Stool "active"? Active stools are ergo-friendly seats that allow users to perch and move more. This concept is important when it concerns children, because growing bodies need to be able to move. Who would have thought all of that fidgeting is actually good for little ones? This specific stool is designed to let children rotate and wobble while seated for ideal ergonomics. I'm a kindergarten teacher. Will these stools fit my students? Yes, depending on your students' heights, we have an active stool that will fit kids ranging from Pre-K up to 5th grade. Starting with our 15" stool, which is designed for children from heights ranging from 40" to 49", and fits kids between Pre-Kindergarten to 2nd grade (about ages 5 to 7). If your students are a little taller, our 17" stool would be better, as it's made for kids between the heights of 49" and 59" and ages 7 to 10. Note: These are recommendations. Each child is different and will need their body's dimensions to be considered for the perfect fit. I have a balance ball, is this similar? In some ways, yes. While this stool might also engage the body similar to a balance ball, this active stool allows for so much more. Kids will love being able to fidget and move more with a stable stool, which energizes their brains and bodies and improves circulation. Lastly, this is one stool that won't roll away from you when you stand up like a balance ball is prone to do. Is the Kids Active Stool stable? Absolutely! Our Kids Active Stools are extremely stable because they feature an anti-slip rubberized bottom that grips the floor, even when users tilt and rotate on it. However, we recommend that users keep at least one foot on the ground at all times so weight is not shifted too much to either side, which could affect the stool's stability. Can this stool replace standard school chairs? While these movement-boosting Kids Active Stools can be used as a side seat to traditional chairs, if sitting for extended periods, we recommend alternating between sitting on a stool and sitting in a full chair for ideal support. No, this stool weighs just under 7 pounds, which is light enough to be portable but heavy enough to offer stable seated support. The tallest child in my class is 4' 5". Will this work for him? Depending on your child's height, you can figure out which active stool you need. Our 17" stool was designed to fit a wide range of children, roughly from 49" to 59" tall and ages 7 to 10. If your child is shorter than this, we advise using our 15" Kids Active Stool, which is suitable for kids ranging from 40" to 49" tall, from ages 5 to 7. What colors can I choose? The Kids Active Stool is available in vibrant blue or green bases and gray seats on both. Yes, we've tested these stools with a collection of young sitters and their feedback was a resounding "yes!". Not only did they love the being able to rotate, wobble, and move on their seat, but the subtly-sloped seat was comfy to sit on, too! 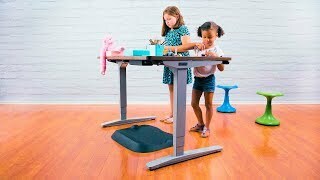 Will the Kids Active Stool tip over when a child is seated on it? Tip-overs should not be an issue thanks to the non-slip base on the bottom of the base, which grips the floor when the stool is in use for safe tilting in any direction. However, we do not recommend leaning too far to the side or back, because doing so puts more weight on one side of the stool, making it more likely to tip. Can this be used on carpet? Absolutely! This stool is designed to work safely on carpet, rugs, hardwood, concrete, and more! How long can my kids sit on this? We advise using these stools as complements to your kids' usual seating, which lets them have the perfect blend of engagement, movement, and support throughout the day. Instead of focusing on how many minutes this stool should be used for, it's better to let kids listen to their body, and when they start to feel fatigued, switch their posture or seating on their own schedule. Bring color and motion into your child's study or play area with the Kids Active Stool. This fixed height stool is available with a blue or green body and gray seat. Let your child burn off some of that energy while still getting their homework done on time with this motion stool. We make it easy to choose which stool will fit every kid, from Pre-K to 5th grade! Pick our 15" active stool for kids ages 5 to 7 (with heights between 40" to 49"), or the 17" active stool for children 7 to 10 (with heights between 49" to 59"). Note: These are recommendations, and taller children or kids with longer legs will need to choose the 17" stool for the most comfort. In a hurry? Get your accessories even faster; just add our expedited production option to your order. Place your order by 3 pm Central on a business day and and we guarantee your order will ship the same day. If placed after this time, your desk is guaranteed to ship the following business day. If your selected item is not in stock, it will ship per the above guidelines as soon as it arrives.